It is my privilege to welcome you to the web site of our congregation, St. James Lutheran Church in Jackson, MI. We are delighted that you are interested in learning more about our mission and ministry, and I hope that you will get a chance to come and worship with us sometime soon. We are a Lutheran congregation in the Christian tradition and we are glad to welcome you among us. Please browse the information on this page, and if you have any questions that are not covered, please give us a call at (517) 782-8297 or e-mail our church office. May God’s Blessings be upon you not only this day, but always. 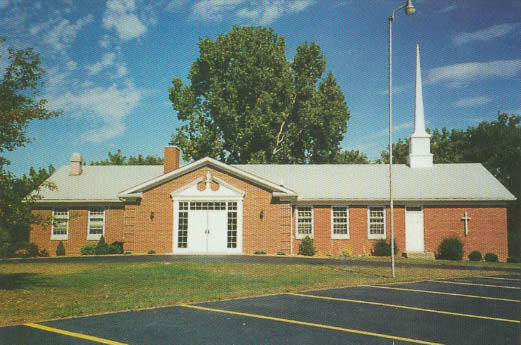 The address for the church is 4425 South Jackson Road, Jackson, MI 49201. We are located in Summit Township directly across the street from the Township Offices at the corner of Ferguson Road and South Jackson Road. If you know where Knight’s Steakhouse and Rite-Aid are, we are directly next door to Rite-Aid. I don’t have much church background. Am I welcome here? Of course you are! All people are welcome here, especially guests and people who have little to no church background. One of the gifts about St. James is that we like to worship and be together in community. We welcome and invite you to come see what that means in the life of our church. We also recognize that people may be at different places in their faith journey and may want to proceed at their own pace in that journey. Our congregation is made up of people and families with varied backgrounds, and we appreciate and welcome the diversity of experience and life history that they bring to our life together in community. The name of this church is St. James Lutheran Church. What does it mean that it is a “Lutheran” church? Lutherans are Christians who received their name in the 16th Century from Martin Luther during the Protestant Reformation. We are a church that believes in the triune God, that is one God in three persons- God the Father, God the Son, and God the Holy Spirit. The Lutheran church places a strong emphasis on the Word of God and the importance of the Bible as source and norm for our lives of faith. If you are interested in learning more about what a Lutheran is, please click on this link. What should I wear when I attend worship services or other events at the church? St. James does not have a dress code. You will see a variety of clothing among those who come to worship that ranges from somewhat formal attire (dresses, skirts, or pants for women; and dress shirts and sport coats for men) to much more casual styles of clothing. We welcome you among us and we encourage you to come as you are. Where do I park? How do I enter the building? Our parking lot includes designated spaces for guests near the front of the parking lot. The entrance to the church is on the parking lot side of the building and there is a driveway leading up to the door for ease of access. Yes and no. There are no steps as you enter the church building, and most of what happens on Sunday mornings takes place on the main level. The offices, sanctuary, and an accessible bathroom are located on the main level. There are spaces such as the nursery, kitchen, and fellowship hall which are downstairs. To access those spaces, there is a driveway and parking lot that goes around to the back of the church where you are able to enter the building downstairs. At the current time, we do not have elevator access in our building. How long does the worship service usually last? Our worship service on Sunday morning typically lasts about an hour and fifteen minutes. Are children welcome to attend the worship services? Is there a nursery available for younger children? We encourage and welcome children to attend all of our worship services. There is a special time for young children (usually 2-8 years of age) in worship called the “Children’s Sermon” when the pastor calls children up to come together in the front of the church for a brief Bible lesson and prayer. We also have a nursery downstairs from the sanctuary and around the corner to the left if children should get fussy or need some play time. Our nursery is not staffed, but does offer toys and books that may be used if needed. Is there a Sunday School program or a summer Vacation Bible School program available for my children in addition to attending worship services? Yes! Our congregation has a dedicated Sunday School program. We also have first communion instruction, a two-year joint confirmation program with our sister churches, and a great Vacation Bible School program every summer. What if I, or my child, need to get up and leave in the middle of the worship service? If a need arises, feel free to leave and return as you are able. Restrooms are located downstairs and to the right in the hallway leading to the kitchen and fellowship hall. We welcome children to stay in worship even if they are a little fussy, but should you need to take them outside the sanctuary, feel free to use the nursery or any other space you might need. There is a portable speaker downstairs so that you can still listen to the service and there is a speaker in the narthex (the gathering space) where you may still hear the service as well. Will I have to introduce myself or stand up to be recognized if I am a guest at a worship service? No, we do not ask our guests to stand up during the service and introduce themselves. However, we hope you will feel welcome and perhaps stay for our fellowship time of refreshments and conversation after the Sunday morning service, if you wish. We would welcome you to fill out the guest worship information sheet in front of our attendance sheet that is passed out at the beginning of service so that we know you were our guest this week. How will I know what to do during the worship service? Each worshipper is given a worship bulletin by an usher as they enter the sanctuary (worship area). The bulletin provides a brief outline of the worship service, the Scripture readings for the day, and some information about what’s going on at St. James. Most of what happens in worship appears on projection screens that are in the front of the sanctuary, but the worship leaders are good at letting people know where they are in the worship service. As a guest, am I expected to contribute to the offering that is taken at each worship service? As we try to be good stewards (caretakers) of all that God has given to us- including our time, abilities, and money- we ask our members to contribute financially as they are able to help support the ministry of St. James as well as the mission of the larger church both nationally and worldwide. We offer our financial gifts to God as an act of thanksgiving for all that God has already given us and as a way of participating joyfully in God’s mission of love and service to our neighbors, our community, and our world. As a guest, if you wish to contribute to our congregation’s ministry, you are most welcome to do so, and we thank you for your generosity. However, no one is required to make a financial offering. Can I take Holy Communion when I visit the worship service? We welcome all people to receive the bread and wine of Holy Communion. If you come from another denomination, please know that you are certainly welcome to come forward and celebrate Holy Communion at St. James. If you have never taken communion or have never been baptized but would like to explore how to do so, please talk to the pastor after the worship service or call the church office during the week. Pastor Martha would be delighted to meet you and talk about Baptism and Holy Communion with you. How is Holy Communion served in worship? After the pastor has welcomed folks to the meal of Holy Communion, the ushers will direct worshipers (usually one row at a time) to walk up to the front of the church where you can either stand or kneel at the rail to receive the bread and wine of communion. You will receive the bread first from the pastor and you are invited to eat the bread as soon as you get it. An assisting minister will come around with a tray of wine and grape juice in individual glasses. They will offer you a cup saying, “the blood of Christ shed for you” and you are invited to drink the cup of wine or juice. When you have finished, an acolyte will carry a second tray in which you can put your empty glass. After you have received the bread and wine or juice, you may return to your seat via the side aisle. Young children who do not receive communion may come up with their parents or guardians and receive a spoken blessing from the pastor. Generally, children receive a first communion instruction before they take communion. If your child is interested in receiving Holy Communion, please speak with Pastor Martha. What happens after the worship service? Coffee and refreshments are served in the narthex (the gathering space) after worship on Sunday morning. This is a time to meet people and gather for fellowship and conversation. During the school year after after a brief time in fellowship, Sunday School will begin around 10:30-10:45 a.m. All are welcome to join a class. How can I get more information about the church and its programs? We invite you to read through our web site for more information about specific programs, opportunities, small groups, and other ways our community gathers together. Feel free to contact the pastor, the church office, or other members of the congregation if you have further questions. You can also request that the monthly newsletter with information and a calendar of events be sent to you. For a fuller experience of St. James, we hope that you will join us for worship one day. Come and see!